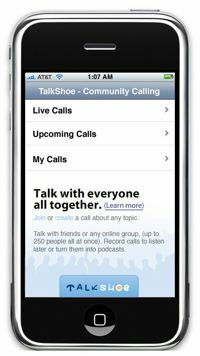 TalkShoe has introduced an iPhone application that lets you participate or conduct community calls from your phone and even lets you use the service to create podcasts. iPhone users can join live calls and view upcoming calls they may want to participate in. The iPhone application provides a one click link to auto dial-in and participate in a call. Up to 250 people can join and talk all together at once. Hosts can create public or unlisted community call episodes and manage them through their iPhone. TalkShoe members can follow specific calls, which can then be viewed from their iPhone or be notified via email or SMS when they start. The iPhone application makes it easy to record a podcast right from your phone. Calls can be recorded for later listening or turned into a podcast. In addition to participating through iPhone, anyone can also participate via phone, mobile phone, Skype, or VoIP via the talkshoe.com website. iPhone users do not need to register to participate in community calls, however registered TalkShoe users can now use their iPhone to conduct or manage their own community call episodes. Visit iphone.talkshoe.com with an iPhone to give it a try. A banner day. I also just found out about installing the fairly new http://iphonevideorecorder.com on my iPhone, so that I finally have more capabilities than Herr Jobs would have wanted us to have.